AS Series - JUMBO SIAMESE - Designed for 2.5, 3, 3.5, 4, 4.5, 5, or 6 inch (65, 75, 90, 100, 115, 125, or 150mm) hose. Siamese appliances feature dual clapper valves to allow one or both inlets to be disconnected without draining the water in the third hose line connection. TFT’s Siamese are more efficient for LDH flow systems. 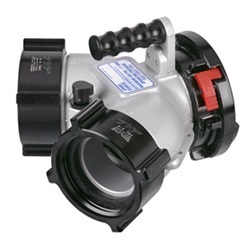 Maximum operating pressure is 250 psi (17 bar). Meets 900 psi (62 bar) hydrostatic strength test. The aluminum castings are hardcoat anodized and TFT-powder coat finish inside and out for maximum corrosion protection. Rugged carrying handle included. Three strategically placed legs allow the appliance to sit off the ground even with 6” Storz on inlet/outlet. Large main housing provides superior strength and durability. Hose couplings are attached using polymer bearing rings, which provide electrical isolation to help prevent galvanic corrosion.